本发明描述了多种实现方式。 The present invention describes a variety of implementations. 几种实现方式涉及对于多深度图的联合深度估计。 Several implementations relate to depth multi-joint depth map estimate. 在一种实现方式中，估计用于第一视图中的位置的第一视图深度指示值，并估计用于第二视图中的对应位置的第二视图深度指示值。 In one implementation, the estimated values ​​for the first view depth indication position of the first view and a second view for estimating depth indication value corresponding to the position of the second view. 基于约束来进行第一视图深度指示值和第二视图深度指示值中的一个或多个的估计。 To estimate one or more first view and a second view depth indication value indicating the depth value based on constraints. 该约束提供了用于对应位置的第一视图深度指示值和第二视图深度指示值之间的关系。 This provides a constraint relationship between the first view and a second view depth indication value for a corresponding depth value indicating the position. 本申请要求2009年1 月7 日提交的题为"JointDepthEstimationforMultiple D印thMaps"的美国临时申请序列号61/204, 485的权益，通过引用将其全部内容并入于此以用于所有目的。  This application claims entitled January 7, 2009 filed "JointDepthEstimationforMultiple D India thMaps" of US Provisional Application serial number 61/204, 485, incorporated by reference in its entirety is incorporated herein for all purpose. 描述涉及编码系统的实现方式。  The described implementations relate to coding systems. 多种具体的实现方式涉及联合深度估计。 A variety of specific implementations involve joint depth estimation. 三维视频（3DV)是针对在接收器侧产生高质量3D呈现的框架。  The three-dimensional video (3DV) is a framework for generating a high-quality 3D rendering at the receiver side of the. 这使能了利用自动立体显示器、自由视点应用、和立体显示器进行3D视觉体验。 This enables the use of auto-stereoscopic display, free viewpoint applications, and a stereoscopic display for 3D viewing experience. 在3DV应用中，由于在传输带宽中的限制和/或存储约束而传送或存储降低数量的视频视图和对应的深度图（典型地被称为多视图加深度（MVD))。 In 3DV applications, due to limitations and / or stored in a transmission bandwidth constraints while reducing the number of transmitted or stored video view and corresponding depth map (typically referred to as multi-view plus depth (MVD)). 在接收器侧，使用可用的视图和深度图来呈现附加的视图。 At the receiver side, using the available depth maps and views to present additional views. 根据总的方面，估计用于第一视图中的位置的第一视图深度指示值，以及估计用于第二视图中的对应位置的第二视图深度指示值。  The first-view depth indicator position for the first view and a second view depth indication value corresponding to a position estimate for a second view according to the general aspect, estimates. 基于约束来进行第一视图深度指示值和第二视图深度指示值中的一个或多个的估计。 To estimate one or more first view and a second view depth indication value indicating the depth value based on constraints. 该约束提供了用于对应位置的第一视图深度指示值和第二视图深度指示值之间的关系。 This provides a constraint relationship between the first view and a second view depth indication value for a corresponding depth value indicating the position. 在附图和以下描述中提出了一种或多种实现方式的细节。  The details of one or more proposed implementations in the accompanying drawings and the description below. 即使以一种特定方式描述，也应清楚可以以多种方式来配置或体现多种实现方式。 Even if described in one particular manner, it should be clear that more may be configured or embodied in various ways implementations. 例如，可以将实现方式执行为方法、或者可以将其体现为装置（诸如，例如被配置为执行一组操作的装置、或存储用于执行一组操作的指令的装置）、或者可以将其体现在信号中。 For example, implementation may be implemented as a method, or it may be embodied as a device (such as, for example, an apparatus configured to perform a set of operations or an instruction means for storing a set of operations performed), or it may be embodied in the signal. 结合附图和权利要求书来考虑以下描述，其它方面和特征将变得明显。 Consideration of the following description of the claims, other aspects and features will become apparent from the accompanying drawings and claims. 图1是来自左参考视图的左深度图的示例。  FIG. 1 is an exemplary view of the left from the left depth of the reference view. 图2是来自右参考视图的右深度图的示例。  FIG. 2 is an example of a depth from the right view of the right reference to FIG. 图3是深度估计器的实现方式的图。  FIG. 3 is a diagram of an implementation of the depth estimator. 图4是视频传输系统的实现方式的图。  FIG. 4 is a diagram of an implementation of a video transmission system. 图5是视频接收系统的实现方式的图。  FIG. 5 is a diagram of an implementation of a video receiving system. 图6是视频处理设备的实现方式的图。  FIG. 6 is a diagram of an implementation of a video processing device. 图7包括图7A和图7B，是第一深度估计处理的实现方式的图。  FIG. 7 comprising FIGS. 7A and 7B, is a diagram of an implementation of the first depth estimation process. 图8是第二深度估计处理的实现方式的图。  FIG. 8 is a diagram of an implementation of the second depth estimation process. 在许多3DV应用中，可以产生中间视图（虚拟视图），并且这样的产生典型地被称为呈现。  In many 3DV applications, may be generated intermediate views (virtual view), and such generation is typically referred presented. 可以使用例如基于深度图像的呈现（DIBR)技术来执行呈现，所述基于深度图像的呈现（DIBR)技术采用所传送/所存储的视图（参考视图）和相关联的每像素深度图作为输入。 You may be used, for example, based on the presentation (the DIBR) technique depth image to perform the rendering, based on the presentation (the DIBR) technique using the transmitted / stored view (the reference view) of each pixel of the depth image and associated depth maps as input. 这样的输入例如可以由MVD格式来提供。 Such input may be provided by, for example, MVD format. 可以使用多种技术中的任一种来捕获深度。 It may be used in any of a variety of techniques to capture depth. 然而，经常仅提供视频，而估计深度。 However, often only offer video, and an estimated depth. 为了获得深度图，经常使用深度估计技术来找到各不同视图之间的对应性。 In order to obtain the depth map, depth estimation techniques are often used to find the correspondence between the different views. 尤其在使用深度估计来获得输入深度图时，生成虚拟视图可能是有挑战的任务。  In particular, when using the depth estimation to obtain the input depth map, generated virtual view may be a challenging task. 即，由于所估计的深度图可能是有噪声的（不准确的），并且可能没有其它的场景信息（诸如，场景的3D表面属性）可用。 That is, since the estimated depth map may be noisy (inaccurate), and possibly no other scene information (such as, 3D surface property of the scene) is available. 有噪声的深度图可能是不准确的，这是因为它们不具有正确的深度值。 Noisy depth map may not be accurate because they do not have the correct depth value. 另外，有噪声的深度图的序列可能具有不是一致性地（consistently)不准确的不准确值。 Further, the depth map noise sequence may not have consistently inaccurate inaccurate value (consistently). 例如，处于恒定实际深度处的对象可能在第一画面中利用低深度被不准确地估计，而在第二画面中利用高深度被不准确地估计。 For example, the actual depth is constant with a low depth of the object may not be accurately estimated in the first screen, the second screen with a high depth are inaccurately estimated. 如果更多参考视图可用于DIBR，则典型地可以实现较佳的视图呈现质量。  If there are more reference views may be used for DIBR, it can typically achieve better rendering quality view. 例如，可以使用两个参考视图来呈现中间视图。 For example, two reference views may be used to render an intermediate view. 在多参考视图的情况下，如果不是已经知道每个参考视图的深度图，则估计每个参考视图的深度图。 In the case of multiple reference views, if not already known depth maps for each reference view, the depth of each of the estimated reference view of FIG. 然而，不同视图的多深度图典型地是被彼此独立地估计的。 However, multiple depth maps are typically different views are estimated independently from each other. 如所提及的，DIBR方法的挑战之一在于以下事实：在各视图间所估计的深度图经常不一致。 As mentioned, one of the challenges DIBR method lies in the fact: the depth map view among the estimated often inconsistent. 在利用两个或多个不一致的深度图来呈现虚拟视图时，这可能导致差的呈现质量。 When using two or more inconsistent depth map to render a virtual view, which may lead to poor quality rendering. 在至少一种实现方式中，我们提出利用联合深度估计来估计参考视图的深度图。  In at least one implementation, we propose the use of joint depth estimation to estimate the depth of the reference view of FIG. 联合深度估计在联合处理中而不是独立地执行对于多参考视图的深度估计。 Joint depth estimation is performed independently rather than depth estimation for multiple reference views in a joint process. 联合深度估计获得更一致的不同视图的深度图，导致了在DIBR呈现的视图中较佳的质量。 Joint depth estimation more consistent depth views of different views, resulting in the preferred mass DIBR view presented. 在至少一种实现方式中，基于中间视图产生两个深度图。  In at least one implementation, the view generation based on the intermediate two depth maps. 该实现方式发展了以下约束：提供两个深度图中对应位置之间的关系。 The implementation of the development of the following constraints: providing a relationship between the position two corresponding depth maps. 可以以多种方式使用该约束来提供两个深度图之间的一致性。 This constraint can be used in various ways to provide consistency between the two depth maps. 在至少一种实现方式中，联合深度估计涉及对用于两个或多个视图中对应像素位置之间的视差的各视差估计成本（失真）执行的求和操作。  In at least one implementation, the combined depth estimation relates to parallax between the respective pixel positions in two or more views for summing operation costs estimate the corresponding (distorted) performed. 在至少一种实现方式中，联合深度估计涉及使用基于照相机距离的求和操作。  In at least one implementation, the combined depth estimation based on summation operation involves the use of the camera distance. 在至少一种实现方式中，基于照相机距离来对求和操作进行加权。 In at least one implementation, the camera-based distance weighted summing operation. 图1示出了根据本原理实施例的为与被已知为"Leaving_Laptop"的MPEG测试序列对应的左参考视图产生的示例的左深度图，可以向其应用本原理。  FIG. 1 shows a diagram of an example of left depth and is known as "Leaving_Laptop" MPEG test sequence corresponding to the left-view generation of the reference embodiment of the present principles may be applied thereto the present principles. 图2示出了根据本原理实施例的为与被已知为"Leaving_Laptop"的MPEG测试序列对应的右参考视图产生的示例的右深度图，可以向其应用本原理。 FIG 2 shows an example of a right depth map view with the right reference is known as a "Leaving_Laptop" MPEG test sequence of the present embodiment corresponding to the principle of generation of the present principles may be applied thereto. 尽管依据所述图不是显而易见的，但是可以观察到： 对于一些具体区域，深度图对中的深度级可能有很大区别。 Although according to the figure is not apparent, it can be observed that: for some specific regions, the depth map may be very different to the depth levels. 具体地，在图1和2的示例中，区别可能大于40。 Specifically, in the example of FIGS. 1 and 2, the difference may be greater than 40. 在这些情况下，理想的区别是零，但是所观察到的区别为例如大于40。 In these cases, it is desirable difference is zero, but the observed differences, for example, greater than 40. 这是不具有一致的深度图的视图的示例。 This is an example of the depth map does not have a consistent view. 关于估计一个深度图所需的输入视图的数量，可以典型地将深度估计算法划分为以下种类：单视图；立体视图；以及多视图。  For estimating the number of inputs required for a view of the depth map, depth estimation can typically be divided into the following algorithm types: single-view; a perspective view; and a multi-view. 所有这三种种类都假设深度图是未知的，并且都使用来自一个或多个视图的视频来产生深度图。 All three types are assumed FIG depth is unknown, and use one or more views from a video to generate a depth map. 在典型实现方式中，在仅一个单视图作为输入的情况下，照相机焦距被考虑为深度估计的平均。  In a typical implementation, the case where only a single-view as the input focal length of the camera is considered to be the average depth estimate. 可以使用被称为"依据焦距的深度（cbpthfromfocus)"的方法，基于散焦或模糊的量来估计深度。 It can be referred to as the "depth of focus distance (cbpthfromfocus)" method, based on the amount of blur or defocus to estimate the depth. 该方法可能不是非常可靠，这是因为例如焦距估计经常不会提供很好的结果。 This method may not be very reliable, because the focal length is estimated, for example, often do not provide good results. 立体视图方法可以使用一对视图作为输入来估计用于所述视图之一的深度图。  a perspective view showing a method using a pair of views can be estimated as an input for one of a depth of view of the FIG. 对于基于区域的立体匹配方法，这样的方法典型地在两个图像之间匹配一窗口内的相邻像素值。 For region-based stereo matching method, such methods typically match an adjacent pixel values ​​within the window between the two images. 选择适当的窗口大小典型地是关键的。 Selecting an appropriate window size is typically critical. 在一些应用中，可以基于局部亮度变化和当前深度估计来迭代地改变窗口大小和形状。 In some applications, it may be iteratively change the window size and shape based on the current depth and the local brightness variation is estimated. 可以应用一些全局约束来产生稠密深度图，即，具有唯一值并且几乎在任何位置都连续的深度图。 Some global constraints can be applied to generate a dense depth map, i.e., with a unique value and are nearly continuous depth map at any position. 随着出现多视图内容，已经探索使用多视图作为输入来进行深度估计。  With the emergence of multi-view content, has been exploring the use of multi-view depth estimation as to input. 一种可能的方法是使用三个视图作为输入（左视图、中间视图、和右视图）来估计用于中间视图的深度。 One possible approach is to use as input three view (left side view, middle view, and right view) is used to estimate the depth of the middle view. 在本领域的典型方法中，目标是产生单个稠密深度图序列。  In a typical process according to the present art, the goal is to generate a dense depth map of a single sequence. 当需要估计多于一个深度图序列时，无论深度估计算法是什么种类，都独立地对每个目标视图执行深度估计。 When more than one needs to estimate the depth map sequence, regardless of what kind of a depth estimation algorithm, is independently performed for each target view of the depth estimation. 因此，很有可能出现各视图间的不一致性。 Therefore, inconsistency between the various views is likely to occur. 图3示出了依据本原理实施例的可以向其应用本原理的示例性深度估计器300。  FIG. 3 illustrates an example may be applied thereto depth estimator 300 of the present embodiment in accordance with the principles of the present principles. 深度估计器300接收目标视图1、目标视图2、以及一个或多个参考视图作为输入。 The depth estimator 300 receives the target view 1, view 2 target, and one or more reference views as input. 深度估计器300提供目标视图1的估计深度和目标视图2的估计深度作为输出。 The depth estimator 300 provides the estimated target depth and target view 1 view 2 as an output estimate the depth. 下面将更详细地描述深度估计器300的操作。 The operation of depth estimator 300 will be described in more detail. 更一般地，深度估计器300提供用于目标视图1的估计深度指示值和用于目标视图2的估计深度指示值。  More generally, depth estimator 300 provides the estimated target view for depth indication value and the target view for estimating the depth indication value of 1 to 2. 深度指示值可以是深度值、或整个深度图。 Depth indication value may be a depth value or depth of the entire FIG. 但是深度指示值可以替代地是例如视差值、或整个视差图。 But the depth indication values ​​may alternatively be, for example, depending on the difference, or the entire disparity map. 在接下来的实现方式和描述中对深度的引用意图包括其它深度指示值，诸如例如视差。 In the following description reference implementations and is intended to include other depth indication values, such as, for example, the disparity of depth. 深度指示值可以提供用于例如整个目标视图或目标视图中一位置的深度指示。 Depth indication values ​​may be provided, for example, a depth indication entire target view or a position in the target view. 该位置可以是例如具体像素、部分、子宏块、宏块、码片或场。 The specific pixel location may be, for example, part of a sub-macroblock, a macroblock, or chip field. 图4示出了依据本发明实现方式的可以向其应用本原理的示例视频传输系统400。  FIG 4 illustrates an exemplary video transmission system can be based on the present invention is an implementation of the present principles 400 applied thereto. 视频传输系统400可以是例如用于使用多种介质（诸如例如卫星、电缆、电话线、或地面广播）中任一种来传送信号的前端或传输系统。 Video transmission system 400 may be, for example, using multiple media (e.g., such as satellite, cable, telephone line, or terrestrial broadcast) any one of a front end or transmission system to transmit signals. 可以在因特网或某些其它网络上提供传输。 Transmission may be provided over the Internet or some other network. 视频传输系统400能够产生并传递具有深度的压缩视频。  The video transmission system 400 having a depth capable of generating and transmitting compressed video. 这通过产生包括深度信息或能够被用来在（可能例如具有解码器的）接收器端合成深度信息的信息的（多个）编码信号来实现。 Or to achieve depth information (s) encoded signals can be used (for example, the decoder may have) on the receiver side in the synthesis depth information is information which includes generating by. 视频传输系统400包括编码器410和能够传送编码信号的发射器420。  The video transmission system 400 includes an encoder 410 and a transmitter capable of transmitting the encoded signal 420. 编码器410 接收视频信息并且产生具有深度的（多个）编码信号。 The encoder 410 receives video information and generates (s) encoding a signal having a depth. 编码器410可以包括子模块，包括例如用于接收并组装多个信息为用于存储或传输的构造格式的组装单元。 The encoder 410 may include sub-modules, including for example, for receiving and assembling means for assembling a plurality of configuration information format for storage or transmission. 多个信息可以包括例如编码或未编码的视频、编码或未编码的深度信息、以及编码或未编码的元素（诸如例如运动向量、编码模式指示值、和语法元素）。 Information may include a plurality of coded or uncoded depth information video, coded or uncoded, and coded or uncoded elements (such as motion vectors, coding mode indication value, and for example, the syntax elements). 发射器420可以例如被适配为传送具有一个或多个比特流的节目信号，其表示编码画面和/或与其有关的信息。  The transmitter 420 may for example be adapted to transmit a program signal having one or more bit streams, or representing encoded pictures and information thereto / related. 典型的发射器执行以下功能中的一个或多个，诸如例如提供纠错编码、将数据交织在信号中、将信号中的能量随机化、以及将信号调制到一个或多个载波上。 Typical transmitters perform one or more of the following functions, such as, for example, provide error correction coding, interleaving the data in the signal, the energy of random signal, and the signal is modulated onto one or more carriers. 发射器可以包括天线（未示出）、或者与天线（未示出）接口。 The transmitter may include an antenna (not shown), or to an antenna (not shown) interfaces. 相应地，发射器420 的实现方式可以包括或被限于调制器。 Accordingly, implementations of the transmitter 420 may include, or be limited to a modulator. 视频传输系统400还可以被全部或部分地包括在多种用户设备中。  The video transmission system 400 may also be fully or partially included in a plurality of user equipment. 这样的设备包括例如蜂窝电话、膝上型或其它计算机、和摄像机。 Such devices include, for example, a cellular phone, a laptop or other computer, and a video camera. 图5示出了依据本原理实施例的可以向其应用本原理的示例性视频接收系统500。  FIG. 5 shows an embodiment of the present principles may be 500 to which an exemplary video receiving system application of the present principles. 视频接收系统500可以被配置为在多种介质（诸如例如卫星、电缆、电话线、或地面广播）上接收信号。 The video receiving system 500 may be configured to receive signals in a variety of media (e.g., such as satellite, cable, telephone line, or terrestrial broadcast). 可以在因特网或某些其它网络上接收信号。 Signals may be received over the Internet or some other network. 视频接收系统500可以是例如蜂窝电话、计算机、机顶盒、电视机、或接收编码视频并提供例如解码视频以供向用户显示或存储的其它设备。  The video receiving system 500 may be, for example, a cellular phone, a computer, a set top box, a television, or that receives encoded video and provides, for example, decoded video for display to a user or other device storage. 因此，视频接收系统500可以将其输出提供至例如电视机的屏幕、计算机监视器、计算机（以供存储、处理、或显示）、或者某些其它存储、处理或显示设备。 Thus, the video receiving system 500 may provide its output to, for example a television screen, a computer monitor, a computer (for storage, processing, or display), or some other storage, processing, or display device. 视频接收系统500能够接收并处理包括视频信息的视频内容。  The video receiving system 500 is capable of receiving and processing video content including video information. 视频接收系统500 包括能够接收编码信号（诸如例如在本申请实现方式中描述的信号）的接收器510、以及能够解码所接收的信号的解码器520。 The video receiving system 500 includes a decoder 520 510, and decodes the received signal can be capable of receiving the encoded signal (e.g. signal such as described in the present application implementation) receiver. 接收器510可以例如被配置为接收具有多个比特流的节目信号，其表示编码画面。  The receiver 510 may for example be configured to receive a program signal having a plurality of bit streams, representing encoded pictures. 典型的接收器执行以下功能中的一个或多个，诸如例如接收调制且编码的数据信号、从一个或多个载波中解调数据信号、将信号中的能量去随机化、将信号中的数据去交织、以及对信号进行纠错解码。 Typical receivers perform one or more of the following functions, for example, such as receiving a modulated and encoded data signal, demodulating the data signal from one or more of the carriers, the energy in the signal de-randomizing the data signal deinterleaving, and error-correction decoding the signal. 接收器510可以包括天线（未示出）、或者可以与天线（未示出）接口。 The receiver 510 may include an antenna (not shown), or may be an antenna (not shown) interfaces. 接收器510的实现方式可以包括或被限于解调器。 Implementation of the receiver 510 may include, or be limited to a demodulator. 解码器520输出包括例如视频信息和深度信息的视频信号。 The decoder 520 outputs video signals including, for example, video information and depth information. 图6示出了依据本原理实施例的可以向其应用本原理的示例性视频处理设备600。  FIG. 6 illustrates an exemplary video processing apparatus according to an embodiment of the present principles may be applied thereto 600 of the present principles. 视频处理设备600可以是例如机顶盒、或接收编码视频并提供例如解码视频以供向用户显示或存储的其它设备。 The video processing device 600 may be for example a set top box, or that receives encoded video and provides other apparatus such as decoded video for display to a user or stored. 因此，视频处理设备600可以将其输出提供到电视机、计算机监视器、或者计算机或其它处理设备。 Thus, the video processing device 600 may provide its output to a television, computer monitor, or a computer or other processing device. 视频处理设备600包括前端（FE)设备605和解码器610。  The video processing apparatus 600 includes a front end (FE) device 605 and a decoder 610. 前端设备605可以是例如被适配为接收具有多个表示编码画面的比特流的节目信号、并从多个比特流中选择要解码的一个或多个比特流的接收器。 Front-end device 605 may be, for example, be adapted to receive a program signal having a plurality of bits represented by the coded picture stream, and the receiver to be decoded to select one or more of the plurality of bit streams from the bitstream. 典型的接收器执行以下功能中的一个或多个，诸如例如接收调制且编码的数据信号、解调数据信号、对数据信号的一个或多个编码（例如，信道编码和/或源编码）进行解码、以及/或者对信号进行纠错。 Typical receivers perform one or more of the following functions, for example, such as receiving a modulated and encoded data signal, demodulating the data signal, one or more encoded data signal (e.g., channel coding and / or source coding) of decoding and / or error correcting the signal. 前端设备605可以从例如天线(未示出）接收节目信号。 A front end device 605 (not shown) receiving a program signal from an antenna for example. 前端设备605将所接收的数据信号提供至解码器610。 The front-end device 605 provides the received data signal to the decoder 610. 解码器610接收数据信号620。  The decoder 610 receives the data signal 620. 数据信号620可以包括例如一个或多个兼容高级视频编码（AVC)、可缩放视频编码（SVC)、或多视图视频编码（MVC)的流。 Data signal 620 may include one or more compatible Advanced Video Coding (AVC), Scalable Video Coding (SVC), or multi-view video coding (MVC) stream. AVC更具体地指代现有的国际标准化组织/国际电工委员会（ISO/IEC)运动画面专家组-4(MPEG-4)第10部分高级视频编码（AVC)标准/国际电信联盟电信分部（ITU-T) H. 264建议（以下称为"H. 264/MPEG-4AVC标准"或其变型，诸如"AVC标准"或简单地"AVC"）。  AVC refers more specifically to the existing International Organization for Standardization / International Electrotechnical Commission (ISO / IEC) Moving Picture Experts Group -4 (MPEG-4) Part 10 Advanced Video Coding (AVC) standard / International Telecommunication Union Telecommunication Division (ITU-T) H. 264 recommendations (hereinafter referred to as "H. 264 / MPEG-4AVC standard" or variations thereof, such as the "AVC standards" or simply "AVC"). MVC更具体地指代AVC标准的多视图视频编码（"MVC"）扩展（附录H)，被称为H.264/MPEG-4AVCMVC扩展（"MVC扩展"或简单地"MVC"）。  MVC refers more specifically AVC standard multi-view video coding ( "the MVC") extension (Annex H), referred to as H.264 / MPEG-4AVCMVC extension ( "the MVC extension" or simply "the MVC") . SVC更具体地指代AVC标准的可缩放视频编码（"SVC"）扩展（附录G)，被称为H.264/MPEG-4AVCSVC扩展（"SVC扩展"或简单地"SVC"）。  SVC refers more specifically AVC scalable video coding standard ( "the SVC") extension (Annex G), is referred to as H.264 / MPEG-4AVCSVC extension ( "the SVC extension" or simply "the SVC") . 解码器610对所接收的信号620的全部或部分进行解码，并且提供解码视频信号630作为输出。  The decoder 610 decodes the received signal of all or part 620 decodes signal 630 and provides decoded video as output. 解码视频630被提供给选择器650。 Video decoder 630 is supplied to the selector 650. 设备600还包括接收用户输入670的用户接口660。 Device 600 also includes a user interface 660 receives user input 670. 用户接口660基于用户输入670将画面选择信号680提供给选择器650。 The user interface 660 based on user input screen 670 will select signal 680 to the selector 650. 画面选择信号680和用户输入670指示用户期望显示多画面、序列、可缩放版本、视图、或可用解码数据的其它选择中的哪个。 Picture selection signal 680 and the user input 670 indicating user desires to display multiple pictures, sequences, scalable versions, views, or other options are available in which decoded data. 选择器650提供所选择的画面作为输出690。 The selector 650 provides the selected picture as the output 690. 选择器650 使用画面选择信号680来选择提供解码视频630中的哪个画面作为输出690。 Using the selector 650 selects picture selection signal 680 which provides video picture decoder 630 as an output 690. 在各种实现方式中，选择器650包括用户接口660,而在其它实现方式中，由于选择器650直接接收用户输入670而不执行单独的接口功能，因而不需要用户接口660。  In various implementations, the selector 650 includes a user interface 660, while in other implementations, since the selector 650 receives a user input 670 directly without a separate interface function performed, and therefore does not require a user interface 660. 例如，选择器650可以以软件形式实现，或者可以实现为集成电路。 For example, the selector 650 may be implemented in software or may be implemented as an integrated circuit. 在一种实现方式中，选择器650与解码器610合并，而在另一实现方式中，解码器610、选择器650和用户接口660全部被集成。 In one implementation, the selector 650 combined with the decoder 610, while in another implementation, the decoder 610, the selector 650 and the user interface 660 are all integrated. 在一个应用中，前端605接收各种电视节目（show)的广播，并选择一个用于处理。  In one application, the front end 605 receive a variety of television programs (Show) broadcast, and selects one for processing. 一个节目的选择基于期望观看频道的用户输入。 Choose a program based on a desired viewing user input channel. 尽管在图6中未示出对前端设备605 的用户输入，但前端设备605接收用户输入670。 Although not shown in FIG. 6 leading end user input device 605, the front end 605 receives a user input device 670. 前端设备605接收广播，并且通过解调广播频谱的相关部分并对解调节目的任何外部编码进行解码来处理期望节目。 Front-end device 605 receives the broadcast, and decoding any outer encoding and demodulating the relevant part of the program to process the demodulated broadcast spectrum desired program. 前端设备605 将解码节目提供给解码器610。 The front end device 605 decodes the program to the decoder 610. 解码器610是包括设备660和650的集成单元。 The decoder 610 is an integrated unit comprising devices 660 and 650. 因此，解码器610接收用户输入，该用户输入是用户提供的对节目中期望观看的视图的指示。 Thus, the decoder 610 receives a user input, the user input is an indication of a desired view the program viewed by the user. 解码器610对所选择的视图进行解码，以及从其它视图中解码任何需要的参考画面，并且提供解码视图690以供在电视（未示出）上显示。 The selected view decoder 610 decodes, as well as any required reference pictures from other views decoding, and provides the decoded view 690 for display on a television (not shown). 继续以上应用，用户可能期望切换被显示的视图，并且然后可能向解码器610提供新的输入。  Continuing the above application, the user may desire to switch the view to be displayed, and may then provide a new input to the decoder 610. 在从用户接收到"视图改变"之后，解码器610解码老视图和新视图两者、以及介于老视图和新视图之间的任何视图。 After receiving from the user "view change", 610 decode both the old view and the new view decoder, as well as any view between the old view and the new view. 即，解码器610对从物理地位于拍摄老视图的照相机和拍摄新视图的照相机之间的照相机拍摄的任何视图进行解码。 That is, any view decoder 610 positioned between the camera captured the old view and the camera to take a new view from the camera physically captured to decode. 前端设备605还接收标识老视图、新视图、以及中间视图的信息。 Front-end device 605 also receives information about the old view, the new view, middle view, and identification. 这种信息可以由例如具有关于各视图的位置的信息的控制器（图6中未示出）、或者解码器610来提供。 Such a controller may have information about the location of each view information (not shown in FIG. 6), or provided by the decoder 610, for example. 其它实现方式可以使用具有与前端设备集成在一起的控制器的前端设备。 Other implementations may use a front end device has a controller integrated with the front end of the device together. 解码器610提供所有这些解码视图作为输出690。  The decoder 610 provides all of these decoded views as output 690. 后处理器（图6中未示出）在各视图之间进行内插以便提供从老视图到新视图的平滑过渡，并且向用户显示该过渡。 Post-processor (not shown in FIG. 6) interpolating between the views to provide a smooth transition from the old view to the new view, and displays this transition to the user. 在过渡到新视图之后，后处理器（通过未示出的一个或多个通信链路）向解码器610和前端设备605通知仅需要新视图。 After the transition to the new view, the post-processor (via one or more communication links not shown) the decoder 610 and the front-end device 605 need only notify the new view. 此后，解码器610仅提供新视图作为输出690。 Thereafter, the decoder 610 only provides as output 690 the new view. 可以使用系统600来接收图像序列的多视图，呈现用于显示的单个视图，并且以平滑的方式在多个视图之间进行切换。  600 may be used to receive the image sequence of multi-view system, present a single view for display, and in a smooth manner to switch between a plurality of views. 平滑的方式可以包含在各视图之间进行内插以便移到另一视图。 It may comprise a smooth manner so as to be interpolated between the view to another view. 另外，系统600可以允许用户旋转对象或场景、或者不同地看到对象或场景的三维表示。 Further, the system 600 may allow a user to rotate an object or scene, or to see a different representation of three-dimensional object or scene. 对象的旋转例如可以对应于从一视图移到另一视图、以及在各视图之间进行内插以便获得各视图之间的平滑过渡或简单地获得三维表示。 Rotation of the object may correspond to, for example, from a view to another view, and interpolating between the views to obtain a smooth transition between the views or simply to obtain a three-dimensional representation. 即，用户可以"选择"内插视图作为要显示的"视图"。 Interpolated view as the "view" to be displayed within the words, the user can "Select." 在至少一种所描述的实现方式中，提出了以联合方式而不是独立地执行用于目标视图的深度估计。  In at least one implementation described herein, the depth estimation is proposed in a joint manner, rather than independently performed for the target view. 在公式（1)中，f是照相机镜头的焦距，1是基线间距（也已知为照相机距离），du 是像主点（principalpoint)偏移的差。  In Formula (1), f is the focal length of the camera lens, a baseline pitch (also known as camera distance), du is the principal point (principalpoint) offset difference. 为了简要地解释du，对于给定照相机1，设Ui指示图像的中心和光学系统的中心之间的差。  To briefly explain du, for a given camera 1, provided the difference between the center of the optical system and the image indicating Ui. S卩，对于照相机i，Ui是从光学中心的中心的图像的中心的偏移。 S Jie, to the camera i, Ui is the center of the image from the center of the optical center shifted. 则du或更具体地(Iui,j为uJPuj之间的差，其中i和j是两个照相机/视图。 Or more specifically the du (Iui, j is the difference between uJPuj, where i and j are two camera / view. 视差指代一个视图中的一位置与另一视图中的对应位置之间的移位或转移(translation)。  disparity shift or transfer means between a position of generation of a view corresponding to the view of another position (translation). 深度指代从照相机平面到视频中对象的距离。 Depth refers to the distance from the camera to the video object plane. 视差和深度两者可能逐像素地变化。 Both parallax and depth may be gradually changed pixels. 深度是应用于单个视图的值。 Depth value is applied to a single view. 另外，焦距应用于单个视图。 Further, the focal length is applied to a single view. 然而，视差和du是描述两个视图内的对应像素之间的关系的相对值。 However, disparity and relative value du relationship between corresponding pixels in the two views described. 另外，1描述两个照相机之间的距离，或者更具体地1描述两个视图（处于视图位置的照相机）之间的关系（距离）。 Further, a description of a distance between two cameras, one or more specifically describe the relationship between two views (in the view of the camera position) (distance). 注意，在许多株度估计方法中，首先估计视差（d)，然后将其转换为株度（Z)，这是因为视差是两个视图之间的对应性、并且可以通过利用诸如均方差（MSE)或绝对差之和(SAD)等之类的成本函数（也被称为失真）来搜索其它（多个）视图中的最相似像素来识别。  Note that in many strains estimation method, first, estimating the disparity (D), and then convert it to the degree of strain (the Z), because the corresponding disparity between the two views, and may be such as by using average cost function of the variance (MSE), or sum of absolute difference (SAD) or the like (also referred to as distortion) to search for other (multiple) views identify the most similar pixels. 不失一般性，我们提供了可以如何基于所捕获的视图来产生深度图的示例。  Without loss of generality, we can provide examples of how to generate a depth map based on the captured view. 我们假设：具有用于5个所捕获的视图（即，视图1到视图5)的视频，并且希望估计用于视图2 和视图4的深度图。 We assume that: with a view for five captured (i.e., the view 1 to view 5) video, and estimating the depth desired and the view of FIG. 2 for 4 view. 在一个可能处理中，使用来自视图1、2和3的视频作为输入，以便估计视图2的深度图。 In one possible process, a view from a video as input, 2 and 3, in order to estimate the depth of the view of FIG. 2. 类似地，使用来自视图3、4和5的视频作为输入，以便估计视图4的深度图。 Similarly, the use of video views from 3, 4 and 5 as an input, in order to estimate the depth of view of FIG. 以此方式，独立地产生视图2和视图4的深度图。 In this manner, the depth map view generated independently 2 and 4 of view. 值得注意，在刚刚描述的两个深度图估计处理中共享视图3。 Notably, the processing in the shared view of FIG. 3 in two depth estimation just described. 但用于视图2和视图4的深度估计仍是独立的。 But for the estimated depth view 2 and view 4 is still independent. 在没有进行du为零、均等间隔的照相机和相同的焦距的简化的情况下，可以利用更复杂的形式来替代公式（2)，如下面所解释的。  In no du zero, simplified case of the camera equally spaced and the same focal length, it may be utilized instead of a more complex form of equation (2), as explained below. 换句话说，仍可以确定d32和d34之间的关系（即，存在d32和d34应满足的约束）。 In other words, still it can determine the relationship between d32 and d34 (i.e., there is a constraint to be satisfied by d32 and d34). 可以将d32和d34应满足某种约束的事实用于对视图2的深度图和视图4的深度图的联合深度估计。 The fact that  can be d32 and d34 should meet certain constraints for depth estimation combined depth view of FIG. 2 and FIG. 4 is a view depth. 现在形成更一般的约束。  Now a more general constraint. 如果各照相机被均等地间隔开，则I34 = -1 32。  If the cameras are equally spaced apart, the I34 = -1 32. 相应地，如果du值为零并且各照相机被均等地间隔开，则公式（9)简化为公式（2)。 Accordingly, if the value is zero du and the cameras are equally spaced, then the formula (9) reduces to Equation (2). 然而，公式（9)例示了d32和d34之间稍微更一般的约束。 However, Equation (9) illustrates a somewhat more general constraint between d32 and d34. 当然，其它约束也是可能的，并且可以设想其它约束。 Of course, other constraints are also possible, and may assume other constraints. 公式（2)和（9)两者都描述了提供对于两个视图中的对应位置的、用于一个视图的深度指示值（视差）（例如，d32)和用于另一视图的深度指示值（例如，d34)之间的关系的约束。  Equation (2) and (9) described provides for both a corresponding position in the two views, one view for depth indication value (parallax) (e.g., D32), and for the other view constraint relationship between the depth indication values ​​(e.g., d34). 所述位置典型地指代实际像素。 Typically refers to the actual position of the pixel. 公式（2)和（9)中的深度指示值可以等同地被表示为深度。 Equation (2) and the depth indication values ​​in (9) it may equally be represented as a depth. 该约束基于一个或多个照相机参数，诸如例如du34、du32、I34、和I32。  The constraint on one or more camera parameters, such as e.g. du34, du32, I34, and I32. 通过取两个视图的像主点偏移的差，可以从照相机参数中导出此32和du34。 Principal point offset by the difference of taken two views, this can be derived from the camera 32 and du34 parameters. 像主点偏移是固有的照相机参数之一。 Principal point offset is one of the intrinsic camera parameters. 另外，f(照相机镜头的焦距）也是固有的照相机参数，并且在其它实现方式中可以作为约束的一部分。 Further, F (focal length of the camera lens) is intrinsic camera parameters, and in other implementations, as part of the constraint. 可以依据非固有的照相机参数来计算1 34和1 32 (基线照相机间距）。 May be calculated based on the extrinsic camera parameters 134 and 132 (baseline distance the camera). 在该实施例中，提出了四个步骤。  In this embodiment, four steps proposed. 然而，变型可以包括不同数量的步骤。 However, variations may include different numbers of steps. 否则，如果d32和d34不在给定阈值内满足公式⑵，则进行到步骤2。  Otherwise, if the d32 and d34 satisfy the formula given ⑵ not within the threshold, proceed to step 2. 可以以各种方式来执行估计视差（诸如例如d32)。  The estimated parallax may be performed (such as e.g. D32) in various manners. 在一种实现方式中，在视图3中以当前像素为中心的块和视图2中以所选像素为中心的相似大小的块之间执行基于块的比较。 Based on a comparison between the block 2 to perform the selected pixel as the center of similar size in one implementation, 3 in the view centered on the pixel to the current block and block views. 所选像素反映了具体视差。 It reflects the specific selected pixel disparity. 例如，基于块的比较可以是SAD的MSE的计算，对于该具体视差确定失真（或成本）。 For example, the comparison may be based on a block SAD calculation of MSE, determine the distortion (or cost) for that particular disparity. 然后，可以改变所选像素（以及因此具体视差），并且可以执行新的基于块的比较并且可以确定新的失真。 Then, the selected pixel may be changed (and hence the particular disparity), and can perform a new comparison based on a new block and distortion can be determined. 可以评估一系列可能的视差，并且可以选择导致最低失真的视差作为用于d32的估计。 You can evaluate a range of possible parallax, and can choose the lowest result in distortion of the disparity as an estimate for the d32. 步骤2.步骤2涉及当d32和d34不在给定阈值内满足公式（2)的情况。  Step 2. Step 2 When d32 and d34 are not directed to a given threshold value satisfies the formula (2) case. 给定阈值可以是例如偏移或缩放因子。 Given threshold may be, for example, an offset or a scaling factor. 在一种实现方式中，d32的估计值必须在d32的约束值的四个像素（阈值偏移）内（如例如由公式（2)或公式（9)预测的）。 In one implementation, the estimated value of the four pixels d32 must constraint value of d32 (threshold offset) within (e.g. as predicted by equation (2) or formula (9)). 在另一实现方式中，d32的估计值必须在d32的约束值的百分之五（缩放因子阈值）内（如例如由公式（2)或公式（9) 预测的）。 In another implementation, the estimated value d32 must be five percent bound value of d32 (scale factor threshold value) (e.g., such as by Equation (2) or formula (9) in the prediction). 设E32和E34分别表示用于d32和d34的估计成本（失真）。  provided E32 and E34 respectively represent the estimated cost (distortion) for the d32 and d34. 例如，像素之间的MSE 是典型的用于视差估计的估计成本。 E.g., MSE between pixels is typically estimated cost for disparity estimation. 即，由于估计不是完美的，因此在基于所估计的视差呈现新视图时存在成本（损失）。 That is, since the estimate is not perfect, cost (loss) there is in presenting a new view based on the estimated disparity. 当然，在保持本原理的精神的同时，还可以利用其它的成本函数。 Of course, while maintaining the spirit of the present principles, you can also use other cost functions. 由于我们已经知道当d32和d34的估计中的至少一个不满足（2)时它或它们是不可靠的，如果E32和E34之一显著地大于另一个，则很有可能具有较大估计成本的视差估计未能找到良好匹配的像素。 Since we already know that when estimating the d32 and d34 of at least one is not satisfied (2) it or they are not reliable, if one E32 and E34 is significantly larger than the other, it is likely to have a greater estimated cost of pixel disparity estimation could not find a good match. 我们将在视差图中将该视差估计标记为孔洞（hole)，并且仅保留具有较小估计成本的视差，然后进行到步骤3。 We will be the disparity map is marked disparity estimation hole (Hole), retaining only the disparity has a smaller cost estimates, and then proceeds to step 3. 在各种实现方式中，通过确定E32和E34之间的差是否大于给定阈值来作出对E32和E34之一是否显著地大于另一个的确定。 In various implementations, to make one of E34 to E32 and to determine whether significantly larger than the other by determining whether a difference between E32 and E34 above a given threshold. 如果E32和E34不是显著地不同（例如，E32和E34之间的差的绝对值不大于给定阈值），则对于我们而言确定哪一个更可靠变得含糊不清。  If the E32 and E34 are not significantly different (e.g., the absolute value of the difference between E32 and E34 is not larger than a given threshold value), which is for us a more reliable determination becomes ambiguous. 我们提出，对于这种情形，返回到步骤1并利用更新后的搜索参数来执行视差估计。 We propose, for this case, return to step 1 and performs disparity estimation using the search parameters updated. 例如，可以增加搜索范围以便找到更好的匹配。 For example, you can increase your search in order to find a better match. 还可以改变块大小。 Block size may also be changed. 将再次检查公式⑵以及E32和E34，以便确定是否可以前进到步骤3。 And again checks formula ⑵ E32 and E34, in order to determine whether proceeds to step 3. 应该监视迭代的数量以便避免无限的估计循环。 You should monitor the number of iterations in order to avoid an infinite loop estimate. 如果已经执行了给定数量的迭代，但处理仍未能找到可靠的视差值，则将对于每个视差图（视图2和视图4)标记孔洞像素，并且该方法进行到步骤3。 If you have performed a given number of iterations, the process failed to find a reliable disparity value, then the parallax for each view (view 2 and view 4) marking the pixel aperture, and the method proceeds to step 3. 注意，我们已经使用阈值来确定视差是否足够地满足约束。  Note that we have used to determine whether the disparity threshold adequately satisfy the constraints. 我们也已经使用阈值来确定失真是否显著不同。 We also have used a threshold to determine whether the distortion significantly different. 然而，其它实现方式在这些情形的一个或多个下为一对视差值分配置信度（confidence)。 However, in other implementations one or more of these cases the disparity values ​​assigned to one pair of confidence (confidence). 基于置信度的测量，可以采取多个动作中的任一个。 Based on the confidence measure, it may take any of a number of actions. 一些实现方式向用户或呈现设备提供置信度的测量。 Some implementations presented to the user or device provides a measure of confidence. 步骤3.如果存在剩余的要处理的像素，则前进到下一像素并且转到步骤1。  Step 3. If the remainder of the pixel to be processed exists, the process proceeds to go to step 1 and the next pixel. 否则， 转到步骤4。 Otherwise, go to step 4. 步骤4.孔洞填补：如果在视图2和/或视图4的视差图中存在孔洞像素，则在该步骤中填补孔洞像素。  Step 4. The hole filling: If there are pixels in view of the disparity map holes 2 and / or 4 in view, the pixel fill holes in this step. 在一种实现方式中，可以基于相邻的视差像素，使用一些内插算法来填补孔洞。 In one implementation, the disparity may be based on neighboring pixels, using some interpolation algorithm to fill holes. 在其它实现方式中，可以仅仅使用相邻的距照相机更远（优选的是背景）的深度级（即，简单地选择更小的视差/更大的深度）来填补孔洞。 In other implementations, may only be used adjacent to farther from the camera (preferably of the background) the depth level (i.e., simply select the smaller parallax / depth greater) to fill the holes. 还注意，以上构造视差（例如，用于视图2)的处理确定用于视图2中与视图3中的位置相对应的位置的视差。  Note also that the above disparity configuration (e.g., for view 2) a process for determining a disparity in position 2 view 3 view corresponding position. 然而，对视图3中的位置采取循环。 However, take 3 cycles of the view position. 相应地，在视图2中可能存在在视图3中没有对应位置的位置。 Accordingly, there may be a position corresponding to a position not in the view 2 view 3. 视图2中的这些位置被简单地在视图2的视差图中保持为孔洞。 2 in view of these positions are simply in view of the disparity map 2 is maintained holes. 相反，视图3中的多个位置可能产生映射到视图2中的同一位置的视差。  In contrast, in view of a plurality of positions 3 may be generated disparity map to the same location in the second view. 在此情况下，较大的视差（较小的深度）是优选的，这是因为其指示前景对象。 In this case, a large disparity (small depth) is preferred because it is indicative of a foreground object. 在图7中示出了实施例1的例程。  FIG. 7 shows a routine of Example 1. 图7示出了依据本原理实施例的用于估计深度的示例性方法700。 Figure 7 shows a method of estimating the depth 700 of an exemplary embodiment of the present principles. 方法700可以由例如图3的深度估计器300执行。 The method 700 may, for example, FIG. 3 depth estimator 300 is performed by 注意，图7中的视图编号以及下面的文字仅仅用于说明/解释目的。 Note that the view numbers in FIG. 7 and the following text only for illustration / explanation purposes. 总的构思可以被应用来联合估计两个视图的深度图。 The overall concept can be applied to estimate the combined depth of the two views of FIG. 在步骤705,像素i被设置为视图3中的下一像素。 In step 705, the next pixel i is set to 3 in view of a pixel. 在步骤710,在目标视图2 上执行视差估计以便得到视差d32。 In step 710, the parallax disparity estimation to obtain the view on the target d32 2. 在步骤715,在目标视图4上执行视差估计以便得到视差d34。 In step 715, the parallax disparity estimation to obtain the view on the target d34 4. 在步骤720,确定d32和d34是否在给定阈值内满足公式（2)。 In step 720, it is determined whether the d32 and d34 within the given threshold value satisfies the equation (2). 如果是，则方法进行到步骤725。 If so, the method proceeds to step 725. 否则，方法进行到步骤730。 Otherwise, the method proceeds to step 730. 在步骤725,按照公式（10)更新d32和d34。 In step 725, according to Equation (10) updates d32 and d34. 注意，该步骤725提供了用于视图2和4的深度图的对应视差值的一致性。 Note that this step 725 provides a consistent depth of FIGS. 2 and 4 a view corresponding disparity value. 在步骤730,确定估计成本E32和E34是否彼此接近（例如，在阈值量内）。 In step 730, it is determined whether the estimated cost E32 and E34 close to each other (e.g., within a threshold amount). 如果是，则方法进行到步骤735。 If so, the method proceeds to step 735. 否则，方法进行到步骤760。 Otherwise, the method proceeds to step 760. 在步骤735,更新视差搜索参数。 In step 735, updating the disparity search parameters. 在步骤740,确定迭代的数量是否大于阈值（迭代的数量）。 In step 740, it determines the number of iterations is greater than a threshold value (number of iterations). 如果是，则方法进行到步骤745。 If so, the method proceeds to step 745. 否则，该方法返回步骤710和715。 Otherwise, the method returns to step 710 and 715. 在步骤745,标记两个视差图视图2和视图4中的孔洞像素。 In step 745, the disparity map marks of the two Figures 2 and 4 in view of the pixel aperture. 在步骤760,标记具有较大视差误差的视差图中的孔洞像素。 In step 760 the pixel holes, having a large parallax map flag in the parallax error. 在步骤750,确定在视图3中是否存在更多像素要被处理。 In step 750, it is determined whether there are more pixels to be processed in the view 3. 如果是，则该方法返回步骤705。 If yes, the method returns to step 705. 否则，该方法进行到步骤755。 Otherwise, the method proceeds to step 755. 在步骤755,填充视差图中的孔洞像素（如果存在任何孔洞像素的话）。 In step 755, the fill hole in the disparity map pixel (if there are any holes, then the pixel). 与实施例1不同，我们提出联合估计成本（失真）函数，使得两个视差（UPd34) 搜索例程被组合到单个例程中。  Unlike Example 1, we propose joint estimation cost (distortion) function, so that the two parallax (UPd34) search routine is combined into a single routine. 使用公式（2)中示出的关系来设计联合视差搜索处理。 Using the relationship shown in Equation (2) is designed in the United parallax search process. 对于每个候选视差d32，基于公式（2)具有对应视差d34，由此可以计算来自d32和d34的联合估计成本函数。 For each candidate disparity d32, based on the formula (2) having a parallax corresponding to d34, whereby the cost function can be calculated from the joint estimation of d32 and d34. 例如，联合估计成本函数可以简单地为E32和E34之和，Ejtjint=E32+E34，其中， d32和d34满足公式（2)。 For example, the estimated joint cost function may simply be the sum of E32 and E34, Ejtjint = E32 + E34, wherein, D32 and d34 satisfy the formula (2). 可以使用高级度量（诸如例如，基于照相机距离的加权和）作为替代度量。 Advanced metrics may be used (such as e.g., weighted based on distance and the camera) as an alternative measure. 评估不同的视差对，并且选择导致最小估计成本&。 Different evaluation parallax pair, and the selection results in the smallest & estimated cost. @的视差对。 @ Parallax of the. 以与实施例1相似的方式产生不同的视差对，其对于d32在可能视差值的预定范围上循环。 In the manner similar to Example 1 to produce different parallax pair d32 cycle for which the predetermined range may vary depending on the difference. 对于每个像素， 该实施例中的所选视差将产生满足公式（2)的视差向量，形成了两个视差图中的一致性。 For each pixel, the selected disparity is generated in this embodiment satisfies the formula (2) of disparity vectors formed two consistent disparity map. 在图8中示出了实施例2的例程。  in FIG. 8 shows a routine of Example 2. 图8示出了依据本原理实施例的用于估计深度的另一示例性方法800。 FIG 8 shows another example for estimating a depth of a method 800 according to an embodiment of the present principles. 方法800可以由例如图3的深度估计器300执行。 The method 800 may, for example, FIG. 3 depth estimator 300 is performed by 注意，图8中的视图编号以及下面的文字仅仅用于说明/解释目的。 Note that, in the view of FIG. 8, and the numbers below are merely illustrative character / illustration purposes. 总的构思可以被应用来联合估计两个视图的深度图。 The overall concept can be applied to estimate the combined depth of the two views of FIG. 在步骤805,像素i被设置为视图3中的下一像素。 In step 805, the next pixel i is set to 3 in view of a pixel. 在步骤810, £_被设置为INT_MAX，其是最大可用整数。 In step 810, £ _ is set INT_MAX, which is the maximum available integer. 在步骤815,对于下一候选视差d32，基于公式（2)计算d34。 In step 815, the disparity for the next candidate D32, based on the formula (2) calculate d34. 在步骤820,基于d32和d34计算联合估计误差E。 At step 820, d32 and d34 is calculated based on the estimation error E. Joint 在步骤825,确定E是否小于£_。 In step 825, it is determined whether E is less than £ _. 如果是，则方法进行到步骤830。 If so, the method proceeds to step 830. 否则，方法进行到步骤835。 Otherwise, the method proceeds to step 835. 在步骤830,将d32best设置为d32，将d34best设置为d34，并且将Emin设置为E。 In step 830, the set d32best D32, D34 is set to the d34best, and Emin to E. 该方法进行到步骤835。 The method proceeds to step 835. 在步骤835,确定是否存在任何更多候选视差要被评估。 In step 835, it is determined whether there are any more candidate disparity to be evaluated. 如果是，则该方法返回步骤815。 If yes, the method returns to step 815. 否则，该方法进行到步骤840。 Otherwise, the method proceeds to step 840. 在步骤840,确定在视图3中是否存在任何更多像素。 In step 840, it is determined whether there are any more pixels in the view 3. 如果是，则该方法返回步骤805。 If yes, the method returns to step 805. 否则，该方法终止。 Otherwise, the method terminates. 在一些实现方式中实施例1和2被一起使用。 Examples 1 and 2 are used together  In some implementations. 例如，尽管实施例1和2可能在许多或所有情况下都同样工作良好，但在存在很少孔洞的情况下实施例2可能比实施例1更好地工作。 For example, although embodiments 2 and may work equally well in many or all cases 1, Example 2 but may work better than 1 EXAMPLES there is little in the case of holes. 相应地，一种实现方式在预计有孔洞的区域中使用实施例1，而在其它区域使用实施例2。 Accordingly, one implementation using the Example 1 is expected to have holes in the area, was used in Example 2 in the other regions. 应清楚，可以在编码器或解码器处执行各种实现方式。  It should be clear, various implementations may be performed in the encoder or decoder. 在一种实现方式中，在编码器（或例如处理器）处执行深度估计，而然后与或不与视频一起传送所估计的深度。 In one implementation, the (e.g., or processors) at the encoder performs the depth estimation, and then with or without transmitting the estimated depth with the video. 在另一实现方式中，无任何深度地传送视频，而接收器执行深度估计。 In another implementation, the depth of the video without any transmission, and the receiver performs the depth estimation. 在传输视频之前不估计深度并且因而不传送深度的情况下，各种实现方式传送关于照相机参数的信息。  does not estimate the depth video before transmission and thus the depth without transmitting, transmitting information about the various implementations of the camera parameters. 在几种实现方式中，传送一个或多个约束，使得接收器知道在联合地估计多深度图时要使用的约束。 In some implementations, transmit one or more constraints, such that the receiver knows the estimated time constraint to be used multiple depth maps in jointly. 在一种这样的实现方式中，在传输时使用标准化格式来编码并传送照相机数量、照相机之间的间距、du值、以及焦距。 In one such implementation, encoded at the transmission use a standardized format and transmits the number of cameras, the distance between the camera, du value, and the focal length. 在另一实现方式中，由于假设焦距对于每个照相机相同以及du值对于每个照相机为零，因此该系统仅编码并传送照相机之间的间距来确定约束。 In another implementation, since the focal length is assumed the same for each camera for each camera and the du value zero, so that the system is only encoded and transmitted between the camera spacing determined constraints. 我们注意到，可以执行用于多深度图的联合深度估计，其中，多深度图是来自不同视图、或来自相同视图。  We note, depth estimation can be performed jointly for multiple depth map, wherein the multi-view depth maps from different views are the same, or from. 例如，多深度图可以在不同时刻来自相同视图。 For example, multi-view depth maps may be from the same at different times. 进一步，各种实现方式可以联合估计相对于来自给定视图的公共视频画面处于各种相对位置的深度图。  Further, various implementations can be combined video picture relative to a common estimate from a given depth in the view of FIG various relative positions. 例如，几种实现方式使用来自视图3的视频来联合估计用于视图1 和2的深度图。 For example, several implementations using 3 video from view to view depth for joint estimation of Figures 1 and 2. 在一种这样的实现方式中，视图3位于视图1和2之间。 In one such implementation, between 1 and 3 view 2 view. 在另一种这样的实现方式中，定位视图3作为视图1-3的最左视图。 In another such implementation, the left-most positioning of the view 3 view as view 1-3. 而在又一种这样的实现方式中，定位视图3作为视图1-3的最右视图。 In yet another such implementation, the view 3 is positioned as the most right side view of the view 1-3. 另外，其它实现方式联合估计三个或更多深度图。  Further, other implementations of three or more joint estimate the depth map. 在这样的实现方式中，确定提供所述三个或更多深度图之间的关系的一个或多个约束。 In such an implementation, determining a relationship between three or more the depth or more constraints FIG. 例如，在上面的示例中视图3可以被用来确定不仅用于视图2和4的深度图、而且还有用于视图5的深度图。 For example, in the above example 3 a view not only to be used to determine the depth of view of FIGS. 2 and 4, but also for the depth view of FIG. 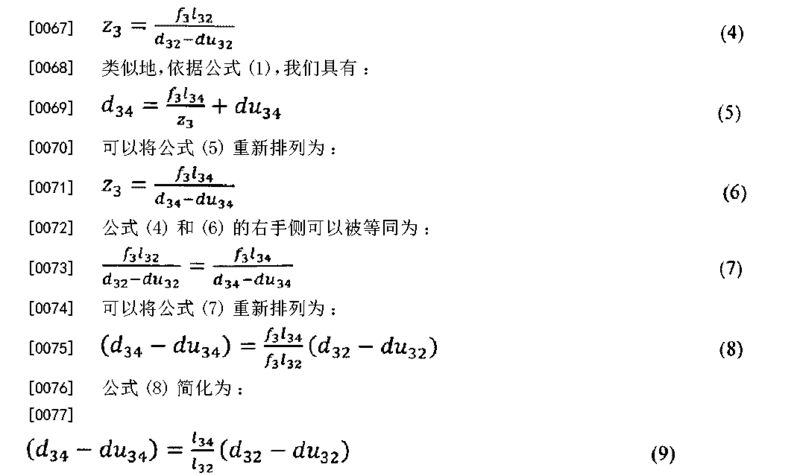 使用上面导出的公式，直接确定d32、d34和d35之间的关系。 Using formulas derived above, directly determine the relationship between d32, d34 and d35. 在本申请中描述的几种实现方式和特征可能被用于H. 264/MPEG-4AVC(AVC)标准、或带有MVC扩展的AVC标准、或带有SVC扩展的AVC标准的背景下。  Several of the implementations and features described in this application may be used in H. 264 / MPEG-4AVC (AVC) standard, or the background of the AVC standard with the MVC extension, or the AVC standard with the SVC extension under. 然而，这些实现方式和特征可能被用于其它标准（现有的或将来的）的背景下、或者不涉及标准的背景下。 However, these implementations and features may be used under other standards (existing or future) in the background, or the background does not involve a standard. 我们因此提供一种或多种具有特定特征和方面的实现方式。  We thus provide one or more implementations having particular features and aspects. 然而，所描述的实现方式的特征和方面也可能被适配用于其它实现方式。 However, features and aspects of described implementations may also be adapted for other implementations. 多种实现方式可以使用各种技术（包括但不限于SEI消息、码片首标、其它高级语法、非高级语法、带外信息、数据流数据、以及隐式信令）来发信号通知信息。  various implementations may use various techniques (including but not limited to, SEI messages, slice header, other high level syntax, non-high-level syntax, band information, stream data, and implicit signaling) signal notification information. 相应地，尽管可能在特定的背景下描述了这里描述的实现方式，但是这样的描述不应被当作将特征和构思限制于这样的实现方式或背景。 Accordingly, although implementations described herein may be described in a particular context, but such description should not be regarded as limiting the features and concepts to such implementations or background. 在本说明书中对本原理的"一个实施例"或"实施例"或"一种实现方式"以及它们的其它变型的引用意味着结合所述实施例描述的特定特征、结构、特性等被包括在在本原理的至少一个实施例中。  or "an embodiment," "one embodiment" in this specification or reference to the principles of the present "one implementation," and other variations thereof, means that a particular feature of the described embodiment, structure, characteristic, and so on It is included in at least one embodiment of the present principles. 因此，在说明书多个位置出现的短语"在一个实施例中"或"在实施例中"或者"在一种实现方式中"或"在实现方式中"以及所有其它变型的出现不一定都指代相同的实施例。 Thus, a plurality of positions in the description appearing phrases or "in an embodiment" or "in one implementation," or "in an implementation," and all other variations, not necessarily all referring to the "in one embodiment" on behalf of the same embodiment. 应当认识到，例如在"A/B"、"A和/或B"以及"A和B中的至少一个"的情况中对于以下的"和/或"和"中的至少一个"的任一个的使用旨在包括仅对于第一个列出的选项（A)的选择、或者仅对于第二个列出的选项⑶的选择、或者对于两个选项（A和B) 的选择。  It should be appreciated that, for example, in "A / B", "A and / or B" and "A and B" at least one case, the following "and / or" and "at least one" used only for a select option (a) of the first listed, or only the selection of the second listed option ⑶, or is intended to include selection for both options (a and B) any. 作为另一示例，在"A、B和/或C"和"A、B和C中的至少一个"的情况中，这种措辞旨在包括仅对于第一个列出的选项（A)的选择、或者仅对于第二个列出的选项（B)的选择、或者仅对于第三个列出的选项（C)的选择、或者仅对于第一个和第二个列出的选项（A 和B)的选择、或者仅对于第一个和第三个列出的选项（A和C)的选择、或者仅对于第二个和第三个列出的选项（B和C)的选择、或者对于全部三个选项（A和B和C)的选择。 As another example, in "A, B and / or C" and "A, B, and C," at least one case, such phrasing is intended to encompass the option (A) of the first listed Alternatively, or only for the selected option (B) of the second listed, or only the selection of the third listed option (C) or only option (a for the first and the second listed and select B), or only for the first and third options (a and C) listed selection, or only for the second and third listed options (B and C) only, for all three or select options (a and B and C). 如本领域和相关领域普通技术人员容易看到的，这可以被扩展用于很多列出的项目。 As one skilled in the relevant skilled in the art and easy to see, which can be extended for as many items listed. 而且，如这里所使用的，词语"画面"和"图像"被可互换地使用，并且指代来自视频序列的静止图像或画面。  Further, as used herein, the terms "picture" and "image" are used interchangeably, and refer to a still image or picture from a video sequence. 如已知的，画面可以是一帧或一场。 As is known, the picture may be a frame or a field. 可以以例如方法或处理、装置、软件程序、数据流或信号来实现这里描述的实现方式。  may be, for example, a method or process, an apparatus, a software program, a data stream or a signal implementations described herein. 即使仅在单种形式的实现方式的背景下进行讨论（例如，仅仅作为方法讨论），所讨论的特征的实现方式仍可能以其它形式（例如，装置或程序）来实现。 Even discussed (e.g., discussed only as a method), the implementation of features discussed may still be implemented in other forms (e.g., an apparatus or program) only in the context of an implementation of a single form. 可以以例如适当硬件、 软件、和固件来实现装置。 It may be, for example, appropriate hardware, software, and firmware means. 可以在例如诸如例如处理器的装置（其总地指代包括例如计算机、微处理器、集成电路、或可编程逻辑器件的处理设备）中实现方法。 For example, a processor may, for example, the device (which generally refer to, for example, comprise a computer, a microprocessor, an integrated circuit processing equipment, or programmable logic devices), such as in the implemented method. 处理器还包括通信设备，诸如例如计算机、蜂窝电话、便携式/个人数字助理（"PDA"）、和便利终端用户之间的信息通信的其它设备。 The processor further includes a communication device, such as computers, cell phones, portable / personal digital assistants ( "PDA"), the other device information and facilitate communication between the end users. 可以在各种不同的装备或应用（具体地，例如与数据编码和解码相关联的装备或应用）中体现这里描述的各种处理和特征的实现方式。  can (specifically, for example, data encoding and decoding equipment or applications associated) implementations embodied in various processes and features described herein in a variety of different equipment or applications. 这样的装备的示例包括编码器、解码器、处理来自解码器的输出的后处理器、向编码器提供输入的预处理器、视频编码器、视频解码器、视频编解码器、网络服务器、机顶盒、膝上型计算机、个人计算机、蜂窝电话、PDA、 以及其它通信设备。 Examples of such equipment include an encoder, a decoder, a post-processor processing output from a decoder, a pre-processor providing input to an encoder, video encoders, video decoders, video codecs, web servers, set-top box , a laptop computer, a personal computer, a cellular phone, PDA, and other communication devices. 如应当清楚的，该装备可以是移动的并且甚至可以安装在移动的车辆中。 As should be clear, the equipment may be mobile and even installed in a moving vehicle. 另外，可以通过由处理器执行的指令来实现各种方法，并且这样的指令（和/或由实现方式产生的数据值）可以存储在处理器可读介质上，诸如例如，集成电路、软件载体或其它存储设备（诸如例如硬盘、紧致盘（compactdiskette)、随机存取存储器（"RAM"）或只读存储器（"ROM")）。  Further, the various methods may be implemented by instructions performed by a processor, and such instructions (and / or data generated by an implementation value) may be stored on processor-readable medium, such as for example, an integrated circuit , a software carrier or other storage device (e.g., such as a hard disk, a compact disk (compactdiskette), a random access memory ( "RAM") or read only memory ( "ROM")). 所述指令可以形成在处理器可读介质上有形体现的应用程序。 The instructions may form an application-readable medium tangibly embodied in a processor. 指令可以例如处于硬件、固件、软件或组合中。 The instructions may for example, in hardware, firmware, software, or a combination thereof. 指令可以在例如操作系统、分离的应用、或两者的组合中找到。 The instructions may be found in, for example, a combination of an operating system, a separate application, or both. 因此，处理器可以被特征化为例如被配置为执行处理的设备、以及包括具有用于执行处理的指令的处理器可读介质的设备（诸如存储设备）两者。 Accordingly, the processor may be characterized, for example, be configured to perform the processing device, and includes a device (such as storage device) readable medium having both a processor for executing instructions processing. 此外，处理器可读介质除了可以存储指令外或者替代可以存储指令，还可以存储由实现方式产生的数据值。 Moreover, the processor readable medium may store instructions in addition to or instead may store instructions, may store the data values ​​produced by an implementation. 如对于本领域技术人员将显而易见的，各种实现方式可以产生被格式化为可以被例如存储或传送的承载信息的各种信号。  As the skilled artisan will be apparent that various implementations may be produced by a variety of signals formatted to carry information may be stored or transmitted, for example. 该信息可以包括例如用于执行方法的指令、或由所描述的实现方式之一产生的数据。 This information may include, for example, instructions for performing a method, or data produced by one of the described implementations. 例如，可以将信号格式化为承载所描述的实施例的用于写入或读取语法的规则作为数据、或者承载由所描述的实施例写入的实际语法值作为数据。 For example, the signals may be formatted to carry the described embodiments of the rules for writing or reading data as the syntax embodiment, the carrier or the actual syntax-values ​​written by a described embodiment as the data. 这样的信号可以被格式化为例如电磁波（例如，使用频谱的射频部分）或者为基带信号。 Such a signal may be formatted, for example, an electromagnetic wave (e.g., using a radio frequency portion of spectrum) or as a baseband signal. 格式化可以包括例如编码数据流并利用编码后的数据流来调制载波。 The formatting may include, for example using the encoded data stream and data stream encoded by modulating a carrier. 信号承载的信息可以是例如模拟或数字信息。 Signal bearing information may be, for example, analog or digital information. 如已知的，可以在各种不同的有线或无线链路上传送该信号。 As is known, the signal may be transmitted on a variety of different wired or wireless links. 该信号可以被存储在处理器可读介质上。 The signal may be stored on a processor-readable medium. 已经描述了多种实现方式。  A number of implementations have been described. 然而，将理解可以作出各种修改。 However, it will be understood that various modifications may be made. 例如，可以组合、补充、修改或移除不同实现方式中的元素，以便产生其它的实现方式。 For example, you may be combined, supplemented, modified, or removed elements of different implementations in order to produce other implementations. 另外，本领域技术人员将理解，其它结构和处理可以替换所公开的那些结构和处理，并且作为结果的实现方式将以与所公开的实现方式至少基本相同的方式执行与所公开的实现方式至少基本相同的功能，以便实现与所公开的实现方式至少基本相同的结果。 Further, those skilled in the art will understand that other structures and processes may replace those disclosed structure and process, and as a result of the implementation will be at least substantially the same manner as disclosed implemented and executed to achieve the disclosed least substantially the same function, in order to achieve and implement the disclosed least substantially the same result. 相应地，这些和其它实现方式是由本申请所预期的，并且在所附权利要求的范围之内。 Accordingly, these and other implementations are contemplated by the present application, and within the scope of the appended claims. 1. 一种联合深度估计方法，包括： 估计用于第一视图中的位置的第一视图深度指示值，以及估计用于第二视图中的对应位置的第二视图深度指示值， 其中，第一视图深度指示值和第二视图深度指示值中一个或多个的估计基于提供了用于对应位置的第一视图深度指示值和第二视图深度指示值之间的关系的约束， 其中，估计第一视图深度指示值和第二视图深度指示值包括： 依据由该约束提供的关系，确定各深度指示值具有相差多于深度指示值阈值的值； 确定用于第一视图深度指示值的第一视图失真； 确定用于第二视图深度指示值的第二视图失真； 在第一视图失真与第二视图失真之间的差值大于失真阈值的情况下，将第一视图中的位置标记为孔洞；以及在第二视图失真与第一视图失真之间的差值大于该失真阈值的情况下，将第二视图中的对应位置标 1. A combined depth estimation method, comprising: estimating a position of a first-view depth indication values ​​of the first view and a second view depth indication value corresponding to a position estimate for the second view, wherein the first a second-view depth indicator and the depth indication values ​​in view of one or more estimated based on providing a constraint relationship between the first view and a second view depth indication value indicating the depth value for the corresponding position, wherein the estimated the first view and a second view depth indication values ​​depth indicator comprising: based on constraints provided by the relationship determining respective depth indication values ​​having a value of depth indication values ​​differing by more than a threshold value; determining a second value indicative of a first-view depth a distorted view; determining a second view of the distortion of the second-view depth indication values; if the difference between the first view and the second view of distortion the distortion is greater than the distortion threshold value, the first view position labeled holes; and the case where the difference between the first view and the second view of distortion the distortion is greater than the distortion threshold value, the second view corresponding position of the scale 记为孔洞。 Referred to as a hole. 2. 如权利要求1所述的方法，其中，该约束基于一个或多个照相机参数。 2. The method according to claim 1, wherein the constraint based on one or more camera parameters. 3. 如权利要求2所述的方法，其中，一个或多个照相机参数包括以下至少一项：第一视图照相机的位置、第二视图照相机的位置、第三视图照相机的位置、第一视图照相机的像主点偏移、第二视图照相机的像主点偏移、或第三视图照相机的像主点偏移。 3. The method according to claim 2, wherein the one or more camera parameters include at least one of the following: a first view of the camera position, the second position of the camera view, the third camera view, the first view of the camera the principal point offset, a second view of the camera principal point offset, or a principal point of view of the camera of the third offset. 4. 如权利要求1所述的方法，其中， 第一视图深度指示值基于来自第一视图的视频和来自第三视图的视频，以及第二视图深度指示值基于来自第二视图的视频和来自第三视图的视频。 4. The method according to claim 1, wherein the first depth indication value based on a video view from a first view and the view of the video from the third, and the second-view depth indication value from a video based on the second view and from the third video views. 5. 如权利要求1所述的方法，其中，估计第一视图深度指示值和第二视图深度指示值包括： 确定用于第一视图深度指示值的初始值； 确定用于第二视图深度指示值的初始值；以及在用于第一视图深度指示值的初始值和用于第二视图深度指示值的初始值在满足该约束的给定阈值内的情况下，基于该约束来更新第一视图深度指示值和第二视图深度指示值中的至少一个。 5. The method according to claim 1, wherein the first estimated value and the second-view depth indication view depth indicator comprises: determining an initial value for a first view of the depth indication values; determining a second-view depth indicator the initial value; and the initial value of the initial value of the depth indication values ​​of the first view and a second view depth indication values ​​in the case of the threshold value to satisfy the constraint given, based on the first constraint update a second-view depth indicator and the depth indication values ​​in view of at least one. 6. 如权利要求5所述的方法，其中，确定用于第一视图深度指示值的初始值包括： 执行多个用于第一视图的视频和用于第三视图的视频的基于块的比较，每个基于块的比较基于用于第一视图深度指示值的不同值并导致失真； 确定用于第一视图深度指示值的使失真最小化的值，在多个基于块的比较中，所述使失真最小化的值导致在多个基于块的比较中具有最低失真的基于块的比较；以及将用于第一视图深度指示值的初始值设置为所确定的使失真最小化的值。 6. The method according to claim 5, wherein determining an initial value for the first view depth indication values ​​comprises: performing a plurality of video blocks based on a comparison for the first view and the view of a third video , based on a comparison of each block based on different values ​​for the first view depth indicator and cause distortion; for determining a first depth indication values ​​of the view minimizes distortion value, based on comparing the plurality of blocks, the said minimize distortion values ​​result in comparison with the lowest distortion is based on comparing the plurality of blocks based on the block; and the initial value of the first-view depth indication value that minimizes the distortion value so determined. 7. 如权利要求5所述的方法，其中，更新包括：将第一视图深度指示值设置为基于用于第一视图深度指示值的初始值的幅度和用于第二视图深度指示值的初始值的幅度的平均值而更新的值。 7. The method according to claim 5, wherein the updating comprises: a first-view depth indicator is set to an initial value based on the amplitude of a first-view depth indication value and a second-view depth indication values ​​of the initial the average amplitude value is updated value. 8. 如权利要求1所述的方法，还包括： 比较第一视图深度指示值和第二视图深度指示值；以及基于该比较，向第一视图深度指示值和第二视图深度指示值分配置信度的测量，其中， 在深度指示值相似时置信度的测量较高，而在深度指示值不相似时置信度的测量较低。 8. The method according to claim 1, further comprising: comparing a first view and a second view depth indication value indicating the depth value; and based on the comparison, the first confidence value and a second-view depth indication view depth indicator assigned measuring degree, wherein the higher measure of confidence at similar depth indication values, and when the depth indication values ​​dissimilarity measure of confidence is low. 9.如权利要求1所述的方法，还包括：使用用于在与所标记的位置相邻的各位置中指示最大深度的、与所标记的位置相邻的位置的深度指示值来填充该孔洞。 The filling used for indicating the maximum depth adjacent to the marked positions of the position, depth indication values ​​adjacent to the position of the mark: The method as claimed in claim 1, further comprising holes. 10. 如权利要求1所述的方法，其中，估计第一视图深度指示值和第二视图深度指示值包括： 确定用于第一视图深度指示值的初始值；以及基于用于第一视图深度指示值的初始值以及基于该约束，确定用于第二视图深度指示值的初始值。 Based on a depth and a first view; determining an initial value for a first view of the depth indication values: 10. The method according to claim 1, wherein the first estimated value and the second-view depth indication view depth indicator comprises the initial value of the instruction value and based on the constraint, the initial value is determined for a second-view depth indication values. 11. 如权利要求10所述的方法，其中， 对于用于第一视图深度指示值的初始值和用于第二视图深度指示值的初始值，确定联合失真；以及基于该联合失真，确定是否选择用于第一视图深度指示值的初始值作为所估计的第一视图深度指示值、以及是否选择用于第二视图深度指示值的初始值作为所估计的第二视图深度指示值。 11. The method of claim 10, wherein an initial value for the first view and the depth indication values ​​for the initial value of the second-view depth indication values, joint distortion is determined; and based on the joint distortion, whether selecting a first-view depth value as an initial value indicative of a first-view depth indication values ​​estimated, and whether selected for a second-view depth indication value as an initial value of the second-view depth indication values ​​estimated. 12. 如权利要求11所述的方法，其中，确定联合失真包括：将用于第一视图深度指示值的初始值的失真和用于第二视图深度指示值的初始值的失真求和。 12. The method of claim 11, wherein determining the distortion joint comprising: an initial value for the distortion of the first-view depth indication value and the initial value for the distortion summation second-view depth indication values. 13.如权利要求11所述的方法，其中，确定联合失真包括：计算用于第一视图深度指示值的初始值的失真和用于第二视图深度指示值的初始值的失真加权和，其中，权重基于包括第一视图照相机、第二视图照相机和第三视图照相机的组中各照相机之间的至少一个距离。 13. The method of claim 11, wherein determining the distortion joint comprising: calculating an initial value for the distortion of the first-view depth indication value and the weighted distortion for the initial value of the second-view depth indicator and wherein , based on the weight of the at least one distance between a first set comprising a camera view, the second view of the camera and the third camera view of each camera. 14.如权利要求1所述的方法，其中，该方法在视频编码器或视频解码器的至少一个中实现。 14. The method as claimed in claim 1, wherein the method is implemented in at least one video encoder or a video decoder. 15.如权利要求1所述的方法，其中，第一视图深度指示值包括以下的一个或多个：用于第一视图中位置的深度值、或用于第一视图中位置和另一视图中对应位置之间的视差的视差值。 15. The method as claimed in claim 1, wherein the first view depth indicator comprises one or more of: the position of the depth values ​​for the first view, the first view position or in another view and depending on the values ​​of the disparity between the corresponding positions. 16.如权利要求1所述的方法，还包括：基于第一视图深度指示值或第二视图深度指示值中的一个或多个，呈现附加视图。 16. The method according to claim 1, further comprising: a depth indication value based on the first view or the second view depth indication values ​​of the one or more additional view rendering. 17.如权利要求1所述的方法，其中，第一视图中的位置是以下之一：第一视图中的像素、第一视图中的部分、第一视图中的子宏块、第一视图中的宏块、第一视图中的码片、或第一视图中的场。 First view of a first view of a first sub-macro block pixel view, the first view portion,: 17. The method according to claim 1, wherein the first view is one of the following positions macroblocks, the first view of the chip, or the first field of view. 18. -种联合深度估计装置，包括： 用于估计用于第一视图中的位置的第一视图深度指示值的部件；以及用于估计用于第二视图中的对应位置的第二视图深度指示值的部件， 其中，第一视图深度指示值和第二视图深度指示值中的一个或多个的估计基于提供了用于对应位置的第一视图深度指示值和第二视图深度指示值之间的关系的约束， 其中，估计第一视图深度指示值和第二视图深度指示值包括： 依据由该约束提供的关系，确定各深度指示值具有相差多于深度指示值阈值的值； 确定用于第一视图深度指示值的第一视图失真； 确定用于第二视图深度指示值的第二视图失真； 在第一视图失真与第二视图失真之间的差值大于失真阈值的情况下，将第一视图中的位置标记为孔洞；以及在第二视图失真与第一视图失真之间的差值大于该失真阈值的情况下，将 18. - Species combined depth estimation apparatus, comprising: means for estimating a first-view depth value indicating a position of the first view; and a second-view depth for estimating a position corresponding to a second view of the value indicating member, wherein the first view and a second view depth indication values ​​of the depth indication values ​​of the one or more estimated based on providing a first depth indication value for a corresponding view of a position and a second-view depth indication value constraint relationship between, wherein the first estimated value and the second-view depth indication view depth indicator comprising: based on constraints provided by the relationship determining respective depth indication values ​​having a value of depth indication values ​​differing by more than a threshold value; determined by the difference between the first view and the second view of distortion the distortion is greater than the distortion threshold value,; distortion in a first view of a first-view depth indication values; determining a second view of the distortion for a second-view depth indication value the position mark is the first view hole; and the case where the difference between the first view and the second view of distortion the distortion is greater than the distortion threshold value, the 二视图中的对应位置标记为孔洞。 Two positions corresponding to the view marked as holes. 19. 一种联合深度估计方法，包括： 基于照相机位置，利用一个或多个约束来估计用于给定像素位置的一对深度，其中，使用来自第一视图的视频和来自第三视图的视频来估计用于第一视图中给定像素位置的深度，而使用来自第二视图的视频和来自第三视图的视频来估计用于第二视图中给定像素位置的深度， 其中，第一视图中给定像素位置的深度的估计和第二视图中给定像素位置的深度的估计中的一个或多个基于提供了用于对应位置的第一视图中给定像素位置的深度和第二视图中给定像素位置的深度之间的关系的约束， 其中，估计第一视图深度指示值和第二视图深度指示值包括： 依据由该约束提供的关系，确定各深度指示值具有相差多于深度指示值阈值的值； 确定用于第一视图深度指示值的第一视图失真； 确定用于第二视图深度指示值的第二视 19. A combined depth estimation method, comprising: based on a camera position, the one or more constraints to estimate depth for a given pixel to a pair of positions, wherein a video from the first view and the views from the third video estimating a position of a first pixel depth in a given view, the use of video and video from the third view from the second view to estimate depth for the second pixel location in a given view, wherein the first view depth estimation of a given pixel position estimate and the second-view depth of a given pixel location based on one or more views for providing a first position corresponding to a given depth and a second view of a pixel position in a given pixel location constraint relationship between the depth, wherein the first estimated value and the second-view depth indication view depth indicator comprising: based on constraints provided by the relationship, having determined the respective depth indication values ​​differ by more than a depth value indicates a threshold value; determining a first view of a first distortion-view depth indication value; determining a second value indicative of a second-view depth view 图失真； 在第一视图失真与第二视图失真之间的差值大于失真阈值的情况下，将第一视图中的位置标记为孔洞；以及在第二视图失真与第一视图失真之间的差值大于该失真阈值的情况下，将第二视图中的对应位置标记为孔洞。 FIG distortion; case where the difference between the first distortion view and the second view is greater than distortion threshold distortion, the first view is the hole position marker; and a distortion between a first view of a second view of the distortion if the difference is greater than the distortion threshold value, the corresponding location in the second view hole mark. 20. 如权利要求1所述的方法，其中，第一视图深度指示值和第二视图深度指示值每个都是从深度值、整个深度图、视差值和整个视差图之一中选择的。 20. A method as claimed in claim 1, wherein the first view and a second view depth indication values ​​values ​​are each indicative of the depth from the depth values, one entire depth maps and disparity values ​​throughout the selected disparity map . 21. 如权利要求1所述的方法，其中，所述约束基于包括与视图相关联的照相机的每个镜头的焦距长度、测量照相机距离的照相机之间的基线间距、以及照相机的像主点偏移的差的比例等式。 21. The method according to claim 1, wherein said distance constraint based on a baseline between the partial focal length of each lens camera comprises a camera associated with a view to measuring the distance of the camera, and the principal point of the camera shift ratio difference equation. 22. 如权利要求21所述的方法，其中，所有照相机共享相同的焦距，所有照相机均等地间隔开，每个像主点等于零。 22. The method according to claim 21, wherein all share the same focal length of the camera, all of the cameras equally spaced apart, each of the principal point is zero.